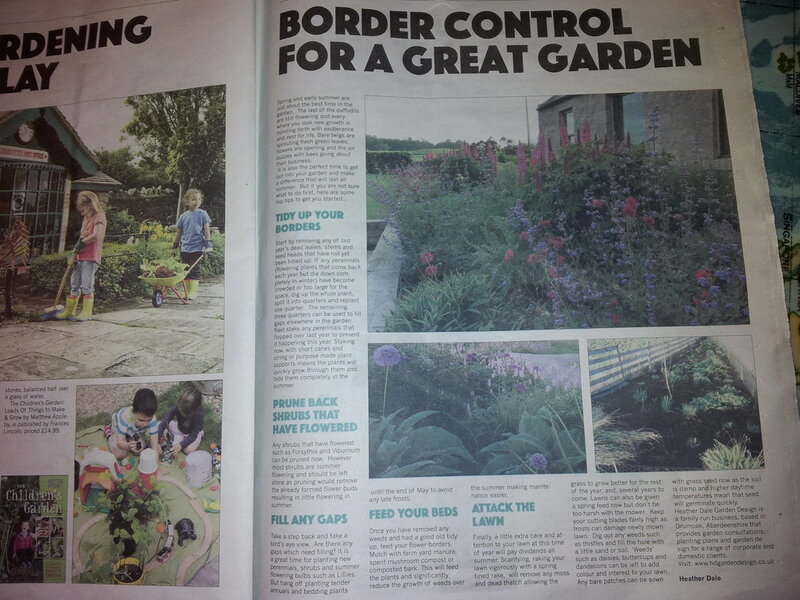 My article in today P&J in the section devoted to launching their Garden of the Year Competition. Spring and early summer is just about the best time in the garden, the last of the daffodils are still flowering and everywhere you look new growth is bursting forth with such exuberance and zest for life. Bare twigs are sprouting fresh green leaves, flowers are opening and the air buzzes with bees going about their business. It is also the perfect time to get out into your garden and make a difference that will last all summer. But if you are not sure what to do first, here are some top tips to get you started…. Start by removing any of last year's dead leaves, stems and seed heads that have not yet been tidied up. If any perennials (flowering plants that come back each year but die down completely in winter) have become crowded or too large for the space dig the whole plant up, split it into quarters and replant one quarter. The remaining three quarters can be used to fill gaps elsewhere in the garden. Next stake any perennials that flopped over last year to prevent it happening this year. Staking now, with short canes and string or purpose made plant supports means the plants will quickly grow through them and hide them completely in the summer. Any shrubs that have flowered such as Forsythia and Viburnum can be pruned now, but most shrubs are summer flowering and should be left alone as pruning would remove the already formed flower buds resulting in little flowering in summer. Perennial border tidied up, weeded and mulched. Take a step back and take a bird’s eye view. Are there any gaps which need filling? It is a great time for planting new perennials, shrubs and summer flowering bulbs such as Lillies. But hang off planting tender annuals and bedding plants until the end of May to avoid any late frosts. Once you have removed any weeds and had a good old tidy up then feed your flower borders. Mulch with farm yard manure, spent mushroom compost or composted bark. This will feed the plants and significantly reduce the growth of weeds over the summer making maintenance easier. Finally, a little extra care and attention to your lawn at this time of year will pay dividends all summer. Scarifying, raking your lawn vigorously with a spring tined rake, will remove any moss and dead thatch allowing the grass to grow better for the rest of the year, and, in fact, for several years to come. Lawns can also be given a spring feed now but don’t be too harsh with the mower. Keep your cutting blades fairly high as frosts can damage newly mown lawn. Dig out any weeds such as thistles and fill the hole with a little sand or soil. 'Weeds' such as daisies, buttercups and dandelions can be left to add colour and interest to your lawn. Any bare patches can be sown with grass seed now as the soil is damp and higher daytime temperatures mean that seed will germinate quickly. So dust off your tools that have been languishing in your shed all winter and get out in your garden as a little work now will make a big difference in the months to come. Heather Dale Garden Design is a family run business, based in Drumoak, Aberdeeenshire that provides Garden Consultations, Planting Plans and Garden Design for a range of corporate and domestic clients.